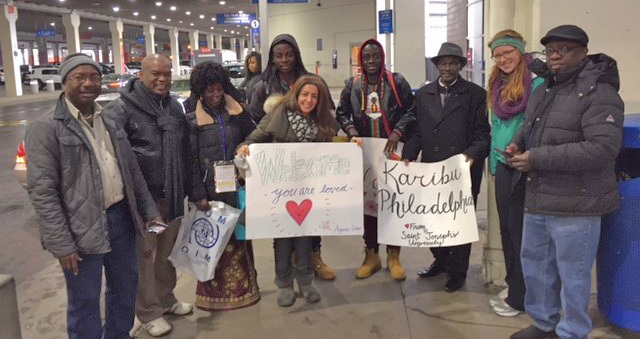 Whatever the hour or season, refugees arriving in Philadelphia through the archdiocesan Refugee Resettlement Program receive a warm welcome at Philadelphia International Airport from volunteers. Representatives of the Aquinas Center in south Philadelphia and St. Joseph’s University frequently volunteer for welcome duty. For many families, summer is a time of small, everyday pleasures. Picnics and pools. Silenced alarm clocks. More time for friends and family. A little give in the work schedule. Yet for one Upper Darby family this ordinary summer is actually extraordinary, playing out a world away from the violence, poverty and trauma they fled in their African homeland. Their grueling flight consumed thousands of miles and several years. But today, thanks to the support of two Catholic parishes and a group of Catholic sisters, the family is settled and safe. And they are not alone. With the help of Catholics across the Philadelphia Archdiocese, more and more families from repressive and impoverished countries are building new lives here and enjoying the same extraordinarily ordinary joys of summer. The three had only the clothes on their backs and a prayer that they would find safe harbor. They had no home to return to; after years of migration, they were legally stateless. Sent to Philadelphia, mother and daughter were initially held at the Berks County detention center in Leesport, known formally as Berks County Residential Center. Eventually, aided by the resettlement agency HIAS, they found temporary shelter with the Sisters of St. Joseph and then with St. Thomas Aquinas Parish. The South Philadelphia parish, led by Msgr. Hugh J. Shields, has long embraced the refugee and immigrant communities and hosts the Aquinas Center in this work. While the family’s journey continued, another journey had begun in Delaware County, where the St. John Chrysostom Parish community in Wallingford was discerning its response to the global migration tragedy. Pope Francis had just taken in refugee families at the Vatican and had challenged Europe’s Catholics to do the same. “When Pope Francis was challenging Catholic institutions in Europe to take in families fleeing their countries because of violence, dire poverty and war, I began preaching about it at the weekend Masses,” said St. John’s pastor, Father Edward J. Hallinan. In the end, St. John’s discernment brought the pastor and parishioners to the door of St. Thomas Aquinas. St. John’s knew that the archdiocese was preparing to revive its Resettlement Program, but the parish was ready to act on its own. That opportunity came sooner than expected: In May 2016, St. Thomas Aquinas decided that it would need new support for Lina and Nami by June 1. St. John’s accepted. Within a few weeks, parishioners and Father Hallinan had accompanied the family to its asylum hearing in federal court, located and fully furnished a two-bedroom apartment, enrolled Nami in school, enrolled Lina in English classes and started a job search, reconnected tutoring help, and moved the family to Upper Darby. Samuel, with a different resettlement status, was living nearby. 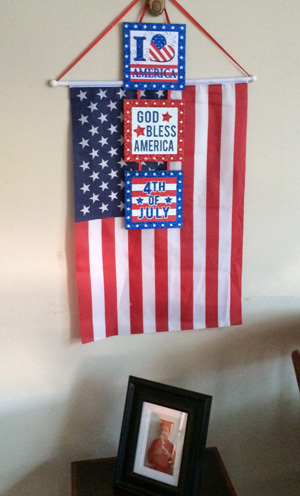 Lina and Nami decorate for their first Fourth of July in their new home, over a photo of Nami’s kindergarten graduation. The family was sponsored for two years by St. John Chrysostom Parish in Wallingford. There was everything to learn: bus routes and banking; the ins and outs of American school life; doctor’s visits and insurance; navigating supermarkets and libraries; operating washing machines and ATMs; and so much more. St. John’s parishioners responded with extraordinary generosity, providing dental and vision care; accompanying the family to libraries, doctor’s appointments, school meetings and events, the supermarket and job hunts; teaching budgeting basics; working with case managers on public benefits; visiting with their children to play with Nami. A welcome lunch at the parish was followed by Thanksgiving at a parishioner’s home. Parishioners also donated all of the family’s household furnishings, and parishioner donations covered the family’s housing, utilities, phone, Internet and other expenses. The parish Society of St. Vincent de Paul took Nami school shopping and provided Christmas gifts. Lina took quickly to her new life and soon gained employment. Eventually, she began to take over her own bills one by one. Nami, quickly fluent in English, flourished in school. In short order, the family put down roots. Just before July 4 of this year, Lina marked her own Independence Day by taking over her last remaining bill from the parish. She is steadily employed and managing the family’s needs. Nami is enjoying her summer at the pool with friends and can’t wait for third grade to begin. Both Mom and daughter are on the path to obtaining green cards and eventual U.S. citizenship. Similar success stories are now happening across the archdiocese since last year’s relaunch of the Refugee Resettlement Program (visit WelcometheRefugee.org) under the auspices of Catholic Social Services. The program is based in Chester. Philadelphia is just one of more than 100 diocesan offices working with the U.S. Catholic Bishops’ Migration and Refugee Services department on resettlement. The church resettles about 30 percent of the refugees who arrive in the U.S. each year — 53,716 people in fiscal 2017. Each individual is vetted rigorously by the U.S. State Department; the review can take years. “As a church that herself bore the cross of hatred toward immigrants, our Catholic past is a compelling reason to welcome the immigrants and refugees among us today,” Archbishop Charles J. Chaput said in announcing the revived resettlement program. The Catholic community in the Philadelphia Archdiocese has welcomed 60 refugees — newborns and octogenarians, individuals and large families — since September 2017. The arrivals have fled from Afghanistan, Iraq, Sudan, Ukraine, Eritrea, Bhutan, Nigeria, the Democratic Republic of Congo and Ivory Coast. Whenever they arrive – be it on a frigid January morning or sweltering July evening — the newcomers are met at Philadelphia International Airport by a loving and dedicated group of Catholic volunteers bearing hugs, signs, car seats and other essentials. Within 90 days of each arrival, CSS case workers help arrange schools, bank accounts, housing, interpreters, and jobs. CSS receives a stipend of $1,125 per person — $925 for rent and $200 for cash assistance. Each adult receives $20 cash and opens a bank account with the remaining $180. “We are passionate about the work that we do daily for the refugees; we pray for God’s guidance to give us the strength serving those who are escaping violent war and persecution,” said Catholic Social Services’ Momolu E. Siryon, a native Liberian who administers the Refugee Resettlement Program. 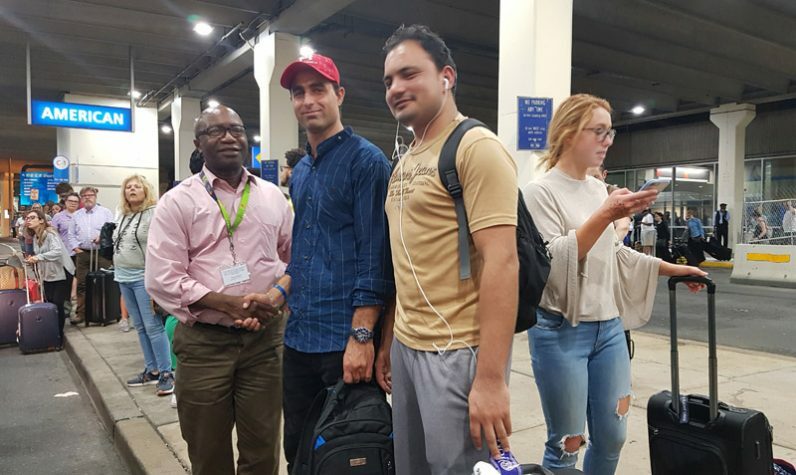 Samuel Z. Abu (left) of Catholic Social Services greets Sayed Mumtaz Hussain (center, in blue) July 23 at Philadelphia International Airport. Hussain, 29, fled his native Pakistan in 2013 and has been a refugee ever since. What happened to Samuel ? Abandoned his family ? Didn’t take him long to fit right in.